Lettere - Just Another Old Castle? No, on the other hand, if you realize that at the time they were built, these castles served specific purposes and were manifestations of long and complicated historical processes: the fall of Rome, the struggle between Byzantium and the West for control of Italy, the birth of the Holy Roman Empire, the beginnings of feudalism, etc. Thus, stepping back and taking a closer look at some of these structures near Naples—those restored as well as those in ruins—gives some insight into a period often glossed over as the "Middle Ages." The gloss covers chivalry, chicanery, knights, codpieces, maidens and castles, but often skips the events that have shaped modern Europe. There are a number of such castles as you drive east out of Naples on the autostrada approaching the Sorrentine peninsula and again on the peninsular road itself. First, on the left as you approach the Salerno-Sorrento junction is the castle of Lettere (photo, right). The castle and the town of Lettere are perched at 340 meters on the western slope of the Lattari mountain range, the backbone of the Sorrentine peninsula that then joins the main Apennine range further east. (The Lattare range is the site, by the way, of the Battle of Mons Lactarius in 553, which ended the terrible Gothic wars in Italy. See this link.) As recently as 2003, the turrets and ramparts of the old castle were quite discernible from the road, but it was a dangerous ruin, though the outer shell was largely intact. The interior was overgrown and in shambles. It looked restorable, however, and they talked about it all the time since it was, at least potentially, a tourist attraction. It was built in the 900s by the then separate city-state of Amalfi on the site of an older Roman fort on that strategic height. (The old Roman fortress at times had hosted no less than Roman dictator Sulla as well as later emperors.) This castle was built in 900s to mark a crucial boundary in the civil war that was then splitting the Duchy of Benevento in two, an event that would determine the next one-thousand years of Italian history (more of which, below). The walls of the castle protected a village called Castrum Lichterensis with a church, shops and dwellings. The castle was then reinforced by the Normans and later by the Angevins. A few years ago, restoration scaffolding went up on the outer walls of the castle, workmen went at it, and the results are worth showing off. The area is part of the Regional Park of the Lattari Mountains. This print by 18th-century artist, J.L. Phillipe Coignet, shows Vesuvius as seen from the ruins of the old Castellammare ("Castle on the sea"). Moving out onto the peninsula, you pass through two tunnels and then down the road onto the coast. On that road is a fine and solid, new-looking castle on your right as you drive out. It is in such good shape—clearly lived in—that it belies its age. This is the castle of Castellammare di Stabia; that is, the castle that the city of Castellammare ("Castle on the Sea") was named for. It is at the base of the ridge below Monte Faito. The modern town below the castle sits on Greek, Etruscan, Samnite and Roman ruins, the Romans being the ones who gave the name Stabia to the site. The castle has been rebuilt many times over the centuries, the last time in 1956 to make it habitable. It is first mentioned in the 1000s as having been built at the behest of the Duke of Salerno (of which more, below). Also, not visible at all from the road, but there nonetheless, are a few smaller structures well up on the hillside, such as the castle of Pino at 500 meters above sea level. It is accessible from the road that passes over the mountain from Castellammare to Agerola. And there are other smaller ruins scattered along the western side of the Lattari range. Many of these castles have a common link. In 774 Charlemagne entered Rome, and, in so doing, took over Lombard holdings in northern Italy and, as well, established his authority over the new Vatican States of central Italy. Thus ended the 200-year Lombard kingdom that had ruled most of Italy since shortly after the fall of the Roman Empire. Then, in 800 Charlemagne had himself crowned with the very crown of the Lombard kings, proclaiming the end of one kingdom and the beginning of another, the Holy Roman Empire. This description leaves out an important item, one that is crucial to understanding the next 1000 years of Italian history: Charlemagne didn't get the job done. He failed in his Justinian-like quest to reunite Italy. Charlemagne spent much of the late 700s fighting Saxons and Moors elsewhere, but in Italy he was content to leave the southern half of the peninsula still solidly in the hands of the Lombards. Left to its own devices, southern Italy became the large Lombard Duchy of Benevento. It was not a monolithic political unit, but the Lombards had always been loose-knit in Italy, anyway, governing as more of a confederation than a single state. Starting in the early 800s, then, from south of Rome all the way down the peninsula, and centering on the town of Benevento, the Lombards continued to hold sway in the south. Thus began the division of Italy into north and south, a division that would not be healed until 1860. The castles mentioned in this article came into being directly because of events in the mid-800s. The Duchy of Benevento underwent a civil war in the 830s. The war was ended by a treaty in 839 that established a separate Duchy of Salerno. This left the Sorrentine peninsula and the area above the Sarno valley in a volatile state. Three duchies were now contiguous: the independent Duchy of Naples, the still vast (in spite of the civil war) Duchy of Benevento, and the new Duchy of Salerno. They all came together in these mountains. Salerno, to keep her neighbors honest, started building forts on the western slopes to keep both Naples and Benevento at bay. 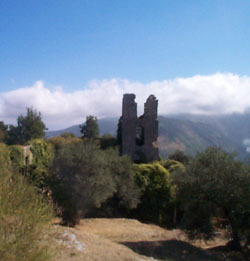 Both the castle of Lettere and the one at Castellammare are from that period, as are the smaller ones mentioned above. The castles did their job until the coming of the Normans in the 11th century. 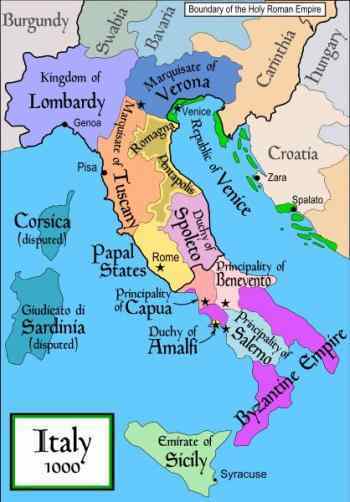 Coming up the boot from their newly-founded Kingdom of Sicily, they fused Southern Italy into a single unit, beginning the modern Kingdom of Naples that would last until 1860. The various castles that had helped cement in place the fragmentation of the south into smaller units passed into the hands of feudal landlords—the dukes and barons—who then ruled their smaller fiefdoms while pledging loyalty to the king of Naples. Many of the structures were of strategic, military importance well past the "age of castles." They served into the 16th and even 17th century and were important in protecting the coastal areas of Naples from marauding bands of Saracens, Muslim pirates who plagued southern Italy for many centuries.